This paper emerges from a concern with the confluence of the following three inter-related issues, all of them concerning Black communities’ territories in northern Cauca region of Colombia: (i) renewed, intensification of violent conflict during the year 2011-12; (ii) the rise of development megaprojects and proliferation of land dispossession; and (iii), a national peace-building plan through land policies and ‘consolidation’ zones. During the last 10 years, the number of private enterprises and foreign investment initiatives in Colombia has increased creating a considerable economic growth that is expected to enhance the much-sought-after state of stability and peace. At the same time, there have been important efforts to create an atmosphere of transitional justice by demobilizing armed groups and creating the Victims’ and Land Restitution Law. Despite this apparent positive panorama, black communities or ‘Afro descendants’, among other marginalized groups, have had to reinforce their claims and social struggles to protect their territories from dispossession by multinational mining companies and public-private joint venture enterprises. This paper examines how government’s dual strategy of mega development projects and peace-building have rendered Black communities, their organizations and their territorial claims ‘enemies’ of development, progress, legality – and even peace. This categorization as development opponents has in turn legitimized the intensification of violence against Black communities. 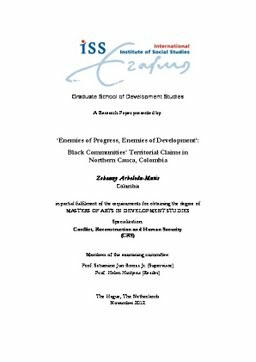 How then do we explain the seeming contradiction between the Colombian’s purported effort at peace-building largely via land restitution on the one hand, and the aggressive pursuit of mega development projects that result in land dispossession of and violent conflict against Black communities? This work seeks to address this apparent contradiction.